With the days getting longer I thought that it was time to get in the first backpacking trip of 2010. 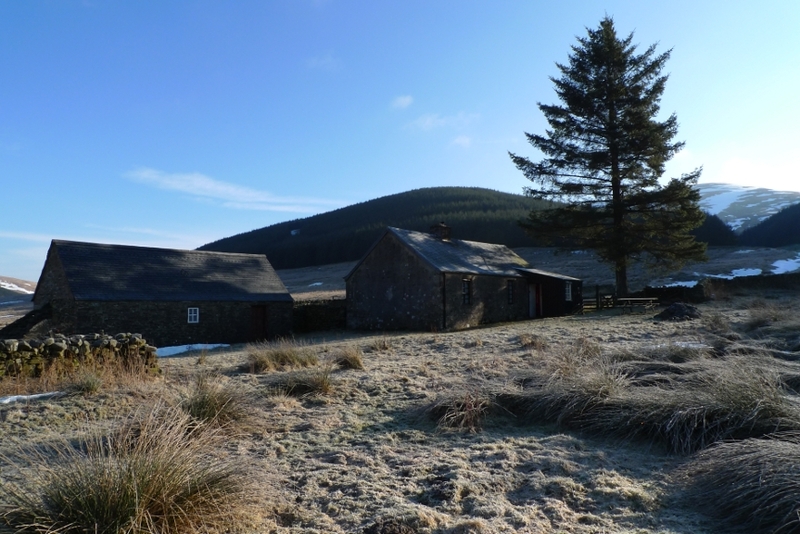 I am a fan of both bothies and wildcamping so with a three day window I could have a night in each. Where to go though? The week before I had an eye on the weather, watching the forecast change day by day. Wales was my initial destination but was overtaken at the last minute by the Southern Uplands which promised three days of sunshine and frosty nights. 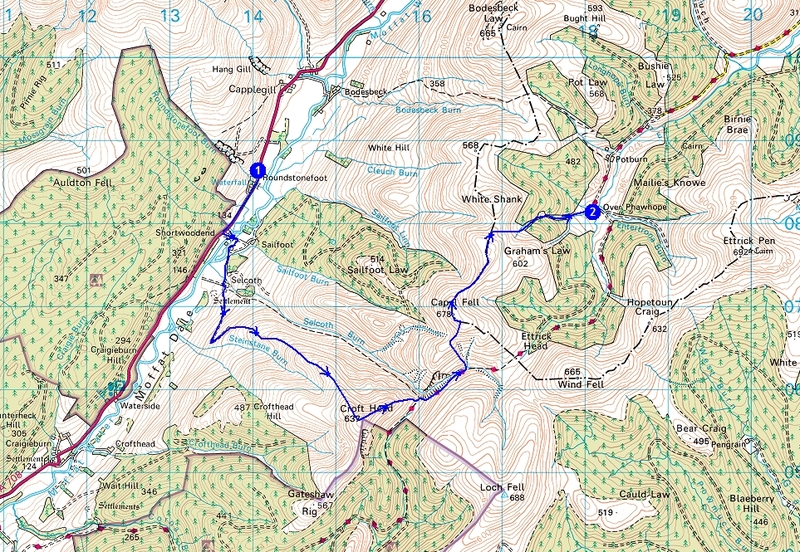 This is an area that is largely overlooked by a majority of hillwalkers and backpackers, I really cannot work out why. 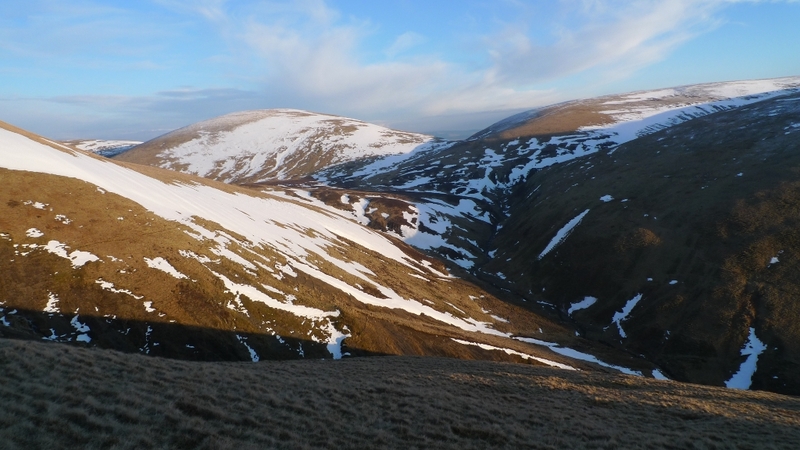 The Moffat hills are easily accessed from the M74 and the journey time only takes an hour longer than a trip to the Lake District if travelling from the south. My original plan had been to start at the entrance to Selcoth fish farm but there was nowhere to park without leaving the van on their drive. I carried on up the A708 and found a village hall (miles from any village) which had a car park without any ‘no parking’ signs. It was past 12.30pm when I finally put my backpack on and set off back down the road. I soon passed the fish farm and the buildings at Selcoth picking up the track that leads onto the shoulder of Croft Head. 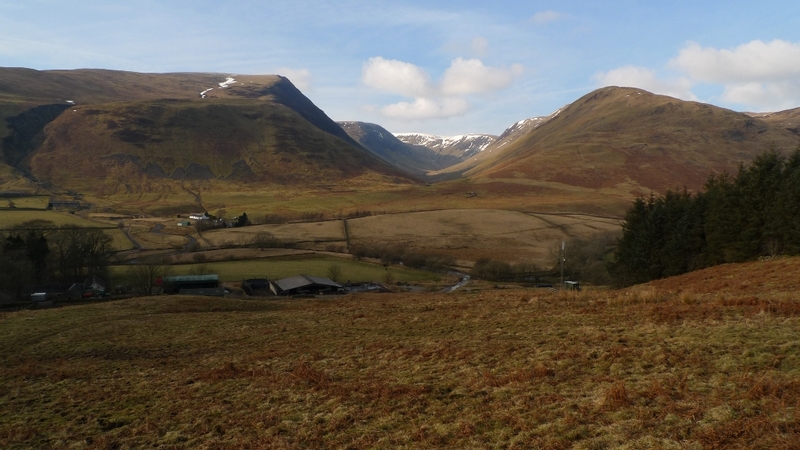 As I started to climb there were great views up Moffat Dale and the hills to the north. My general lack of fitness was felt on the ascent of Croft Head and a lengthy sit down was had on the 350 metre contour. Sheltered from the wind and with the sun on my face there was no where else I would rather be. Unfortunately sitting down is not the best way to climb a hill, so the pack was put back on for the long slow ascent of the north west ridge. The summit was a junction of fences, one of which I followed towards Cat Shoulder. The views towards Ettrick Head were impressive, with the hills still covered in a patchwork of snow. As I descended onto Cat Shoulder Craigmichen Scar dominated the view with the Selcoth Burn cutting a gorge beneath its steep slopes. A newly bulldozed path descends in zig zags to a sheepfold where I picked up the original line of the Southern Upland Way which winds its way across Scotland coast to coast. A walk that I would love to do some day. Along this spectacular stretch the path is little more than a sheep track as it contours high above the river. Thankfully most of the snow had melted on this side of the valley, one slip and it would be a long way to slide in snow. The river soon climbs to meet the path at a scenic little footbridge, giving access to the upper reaches of the valley. 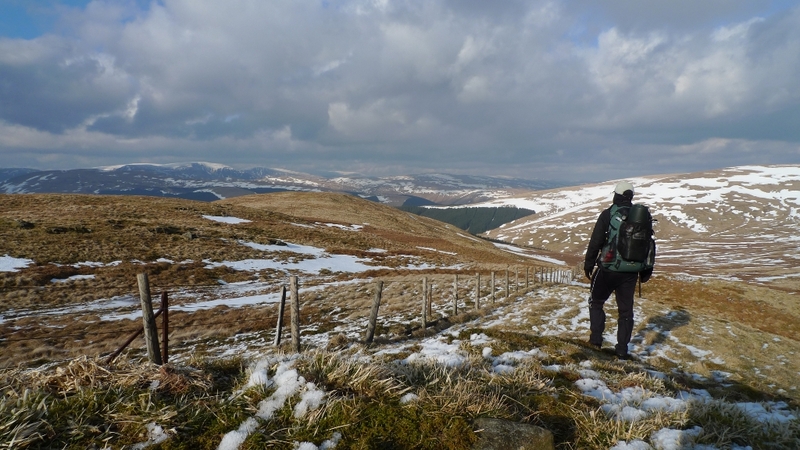 I could see the markers of the Southern Upland Way climb out of the valley across steep snow covered slopes. The snow was rock hard and pretty deep with only the top of the markers showing. 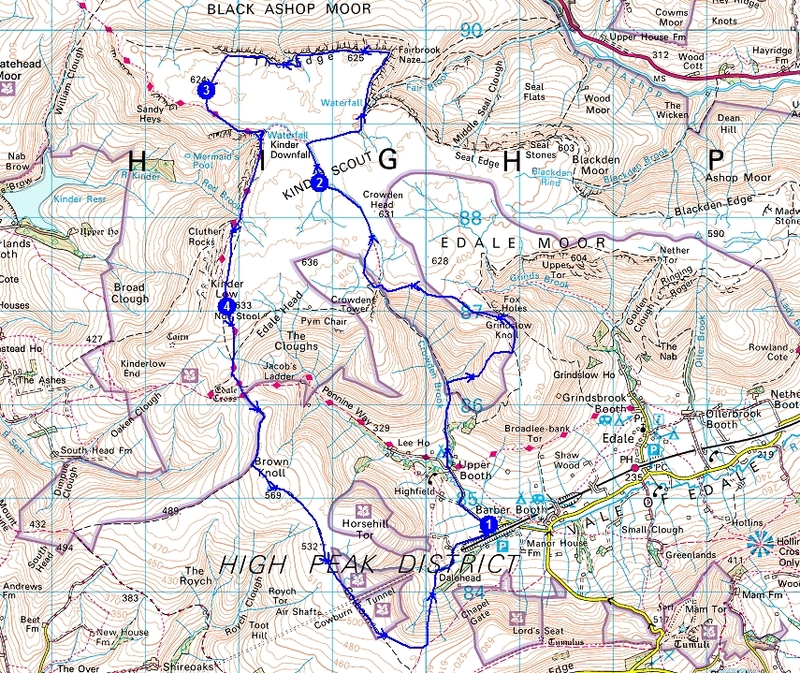 Without crampons it would be pretty difficult going so I decided to ascend Capel Fell alongside Rae Grain instead. The slopes felt much steeper than they looked on the map and my leg muscles forced another sit down. 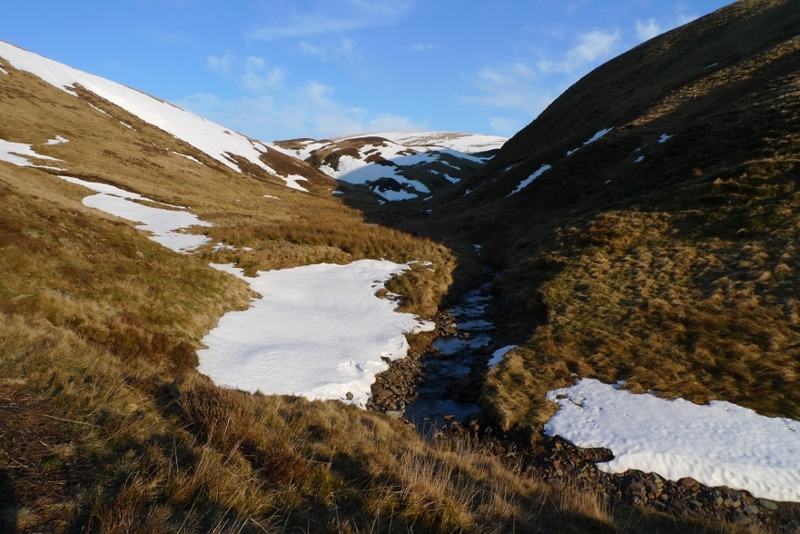 This enabled me to take in the geography of the upper Selcoth Burn leading to Ettrick Head. 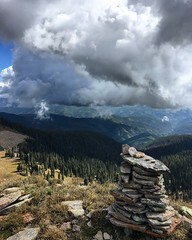 The views from the summit were well worth the effort. The sun was now beginning to set and the temperature was dropping sharply. I got out my new Gorrilapod SLR tripod and experimented with a few ‘posed’ shots of myself staring wistfully off into the distance. My extremities were soon feeling rather cold and I noticed that frost had started to form on my rucksack, time to get moving! 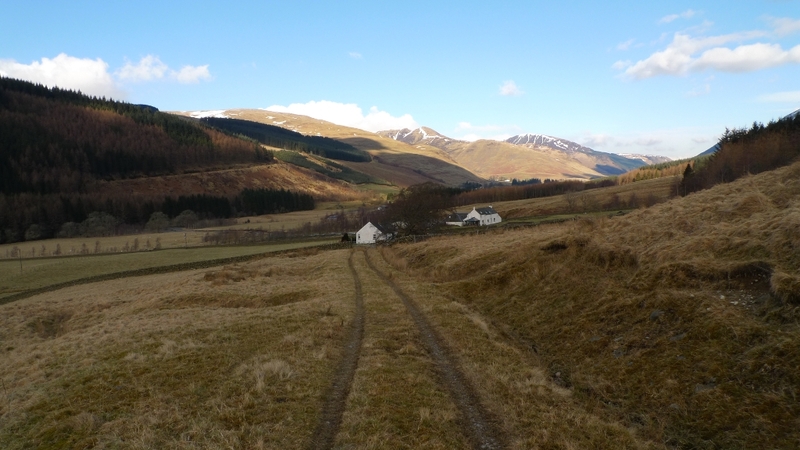 I crossed Smidhope Hill and started to descend alongside the Little Smid Hope into the forest where I got my first glimpse of Over Phawhope bothy. I had my fingers crossed that I would get it to myself, this particular bothy is less than a mile from the road and can get pretty busy. However it all looked dark and quiet and there was no smoke rising from the chimney. I arrived in fading light and entered its cold interior by torchlight for a look around. I quickly bagged a tiny room which had a bunk bed in it before setting about getting a fire lit. I have great gratitute to the person who brought in the 50kg bag of coal and the stack of chopped logs, one definite plus to being near a road and on a drivable track! 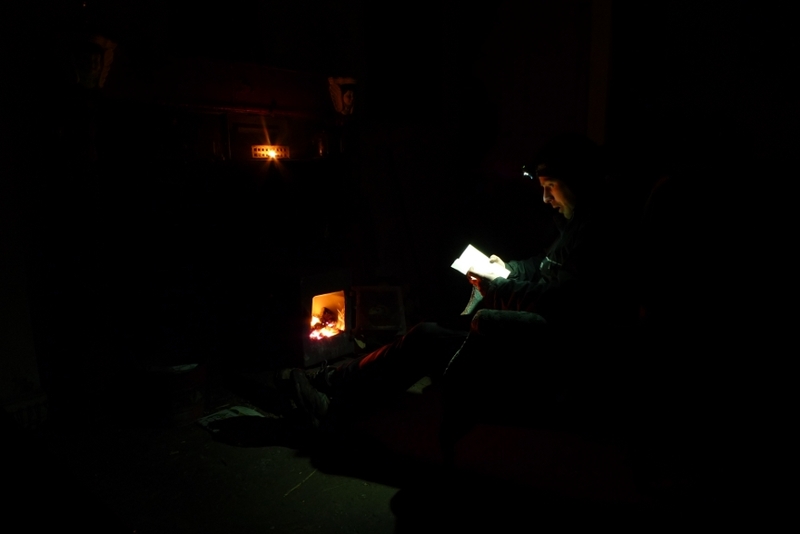 The stove was soon roaring and I spent the evening eating whilst reading a good book. Even with the stove on the go the room never got above 4 degrees celsius, the front of my legs were burning whilst the back of them were freezing. When I went out to collect water the edges of the fast flowing stream had started to freeze……. I was warm and comfy and overslept, finally getting out of bed at gone 9.00am. Going outside to answer a call of nature I noticed that the thermometer on the wall of the bothy was still showing minus 6 degrees celcius. It must have been pretty chilly last night! 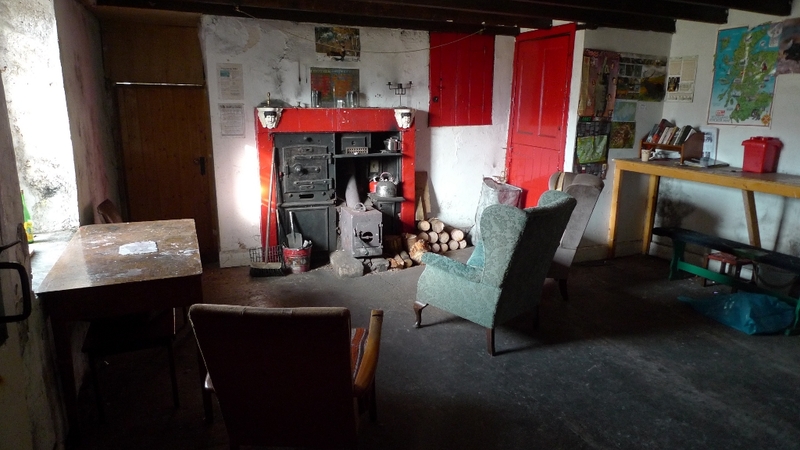 I have to admit that I would have been happy to spend the day at the bothy sitting by the fire and reading, it is in such a lovely spot. Instead I had the luxury of cooking and eating from a comfy armchair before sweeping up and collecting some kindling for the next person. 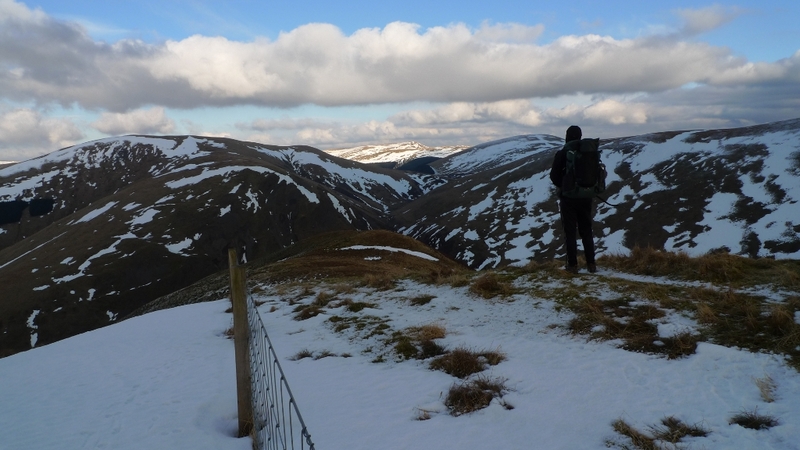 A couple of photos were taken before heading off back towards Ettrick Head along the Southern Upland Way. The forestry track was at a good gradient to warm up my muscles and it was nice to stop and chat to a couple of guys heading in the opposite direction, the first people I had seen since leaving the van. 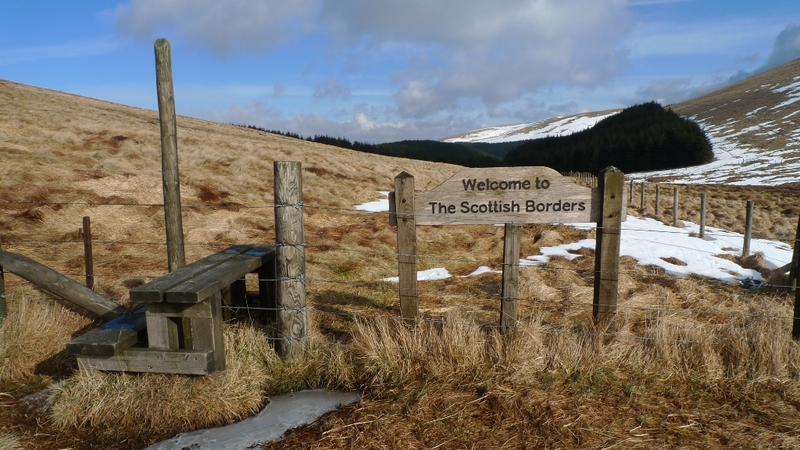 Ettrick head marks the boundary between the Scottish Borders and Dumfries and Galloway. My first destination for the day was the summit of West Knowe which was reached via Parks Well and initially up exceptionally steep slopes. The sort that involves grass scrambling, muttering, and a bit of, ‘I wish I had not come up this way’. Luckily this was short lived and I was once again striding across an easy grassy hillside. Hours were then spent strolling over rolling hills with amazing clear views in all directions, taking in Loch Fell, Wind fell and Hopetoun Craig. The light was constantly changing to dramatic effect and progress was easy following the fence line across hard packed snow. 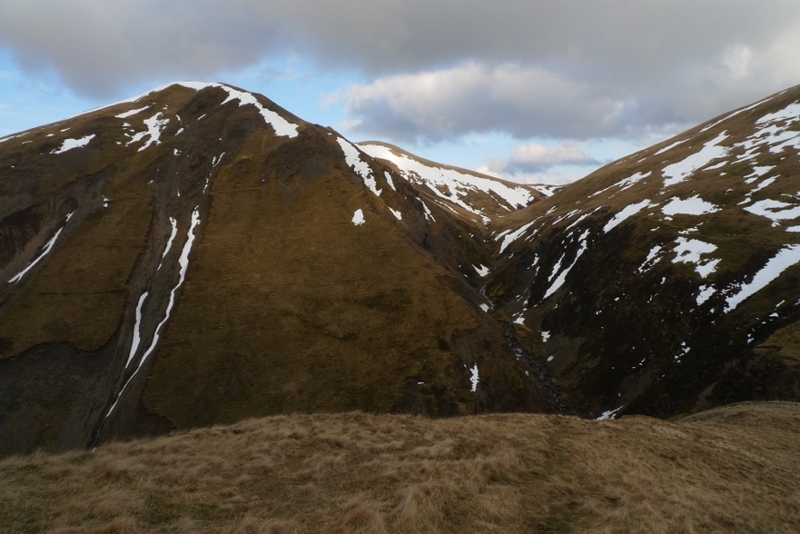 Just before reaching the summit of Ettrick Pen I passed the third and final person in three whole days. As is common in remote spots we stopped and chatted for a bit before going our separate ways. I like these hilltop exchanges, something you rarely get in the crowded Lake and Peak Districts. The Large Cairn was passed on Ettrick Pen and I descended with views down the wilderness of the Cauldron Burns which flow for miles before reaching civilisation. I found a great spot to pitch with access to water but there was still a couple of hours to go until sunset. Plus the ground here was frozen solid! 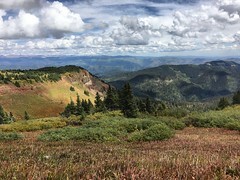 The ridge was followed to the forest edge where Fauld Sike descends into the trees. It was a nightmare descent down steep snow covered slopes, drifts at times covering the stream itself. Thankfully just as I was beginning to question my decision and turn back I hit a forestry track which was followed down to the Ettrick Water. In failing light I skirted over the hillside on the other side of the valley and dropped down to the Kirkhope Burn, still just about in sight of the Farm buildings. I should have continued and been completely out of sight but I had found a great flat pitch on which to spent the long night. My evening was only spoilt by the effect my freeze dried meal had on my stomach, I would just get warm and comfy when a sudden dash outside was needed. Note to self to try a different brand! I managed to oversleep again, sitting up to my usual Akto Shower, the nights condensation dripping onto my sleeping bag. The night had been cold, really cold but there was not the usual white coating of frost. It had been cold enough to freeze my platypus and my boots were a solid block of ice. I had to force my feet into them and run around a bit to break the icy crust, not the best way to start the morning. I had my eyes on the sky which was starting to cloud over with a few flakes of snow, I finally packed up much later than planned. Note to self, stop procrastinating in the mornings! It was an enjoyable ascent of the Kirkhope Burn to its source. 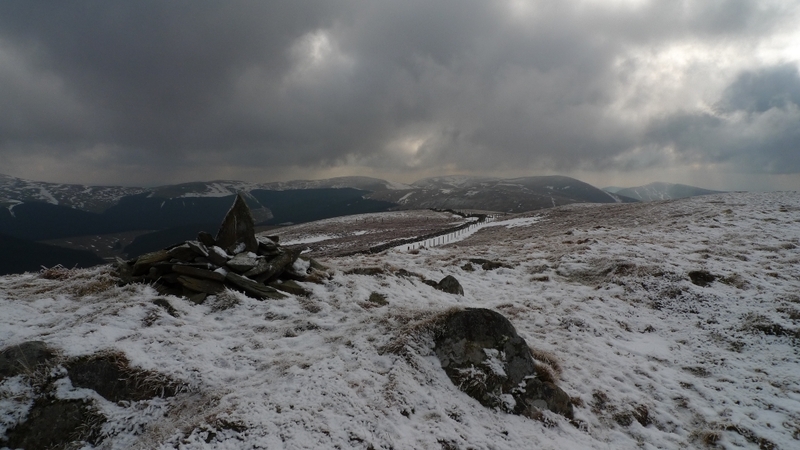 I had originally planned to climb Andrewhinney Hill but lowering clouds and heavy snow put an end to that idea. The summit of Bell Crag was reached with the fence line then contouring above the very steep slopes above Moffat Dale 1550ft below. 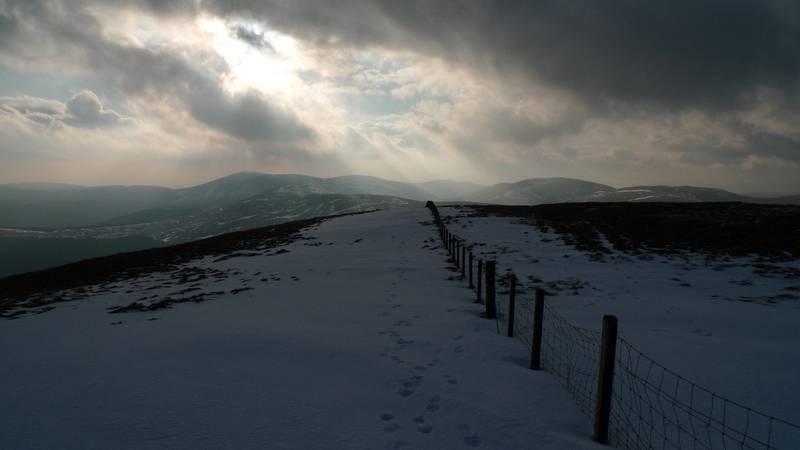 The ridge was followed south to the cairn on Bodesbeck Law where I was greeted with dramatic skies, shafts of sunlight piercing the dark clouds. Descending to the col to the south a track was picked up that led to Bodesbeck farm and then the main road. The Moffat hills on the otherside of the valley began to dominate the view, especially the great scoop of Blackhope burn. A range of mountains that I backpacked a few years ago and somewhere I am keen to return. A massive upland area rising to over 800 metres with only a minor road crossing alongside Megget Water. Why go to the Lake District when there is a spectacular and remote area such as this close by? 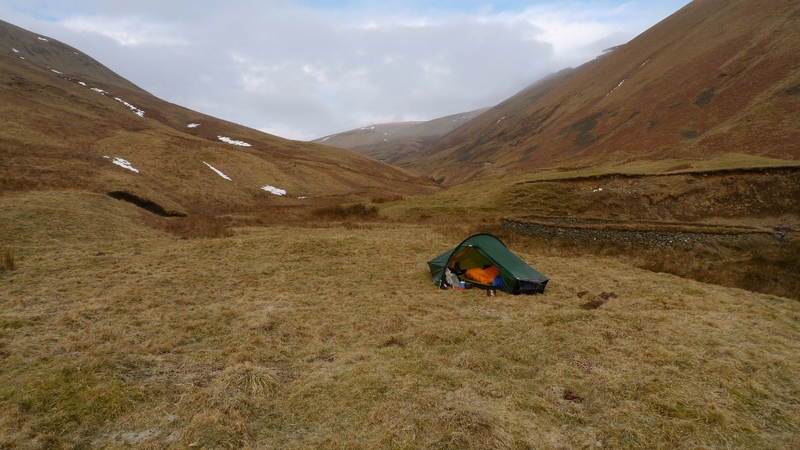 The Ettrick hills I had spent three days crossing were not as spectacular but the feeling of remoteness and isolation more than made up for this. Go on try a new area next weekend! 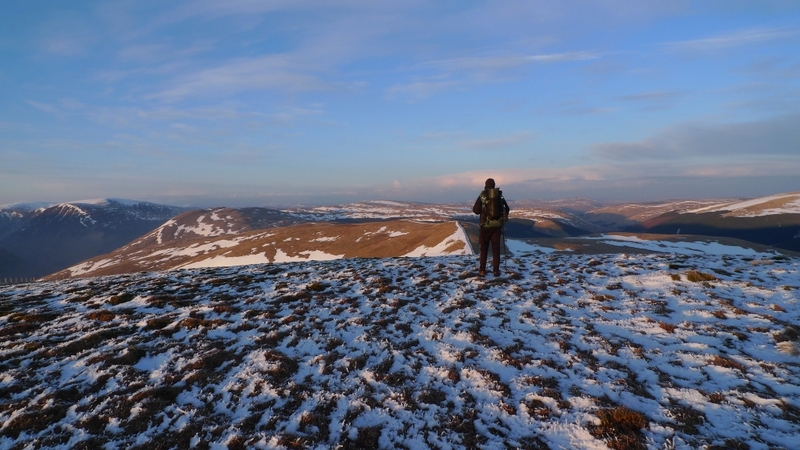 I have just returned after a cracking weekend backpacking solo around some deserted hills. 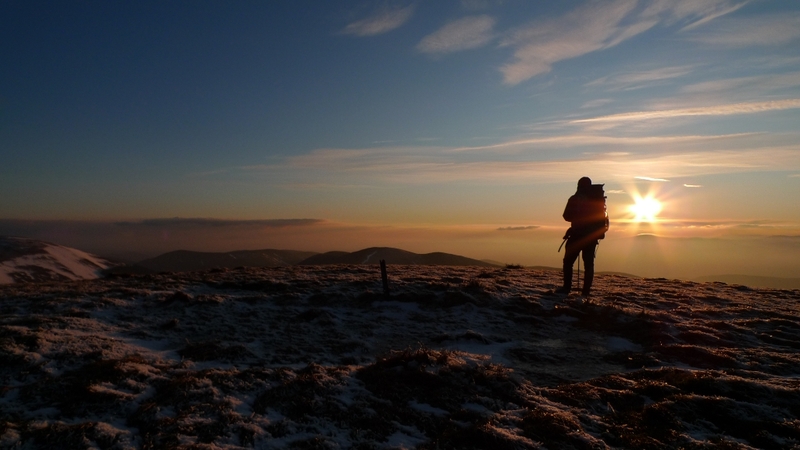 A night in a bothy followed by a wildcamp was beaten by a stunning hilltop sunset on the first evening. 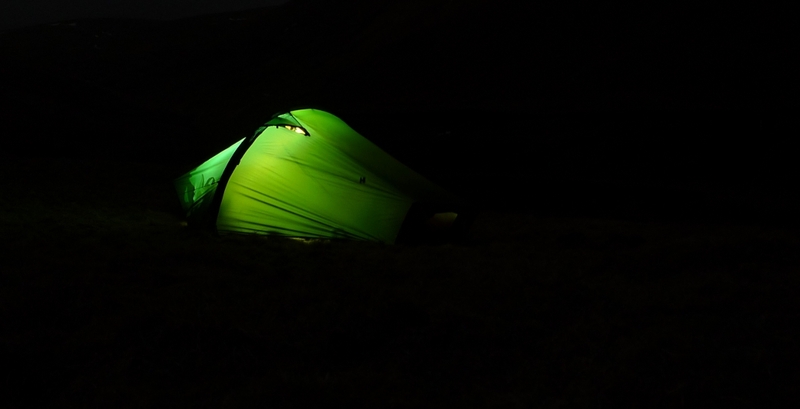 As I stood there taking in the views frost was forming on my rucksack, it turned out to be one hell of a cold night. The sunset was captured and now features as the header for the blog. Where was I? I picked an area that sees very few hikers, especially at this time of year. Can anyone guess from the header or the panorama below? Things are brightening up here at Bongo towers. I had a job interview first thing on Monday morning and after a nail biting wait I was offered the position. It is an advocacy role offering impartial advocacy support to people who use homelessness and supported housing services. I have worked with homeless and vulnerable people for the past five years in an educational support role which I have really enjoyed. However I am excited to have a change in direction whilst still working in the same field. The last few months have been a blur of tiredness and illness since being diagnosed with Hypothyroidism but recently my medication seems to be taking effect. Still not up for running a marathon but its nice not feeling like I have all the time. Fingers crossed I should get out at the weekend for the first backpack of the year. Playing the weather gamble at the moment, got a couple of ideas in my head but am going to wait to see the weather forecast the day before. 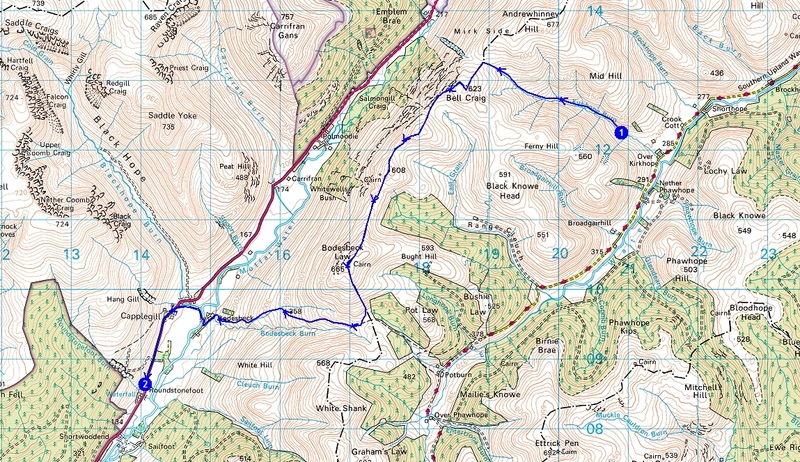 It will then be a mad evening of packing and route planning. Fingers crossed that apathy does not rule again come the end of the week! I have been meaning to do a trip up onto Kinder Scout for a while now but each time it gets planned the clouds are forecast to be draped over its soggy top. Finally a free day to hit the hills and a mountain forecast that promised ‘excellent visability’. 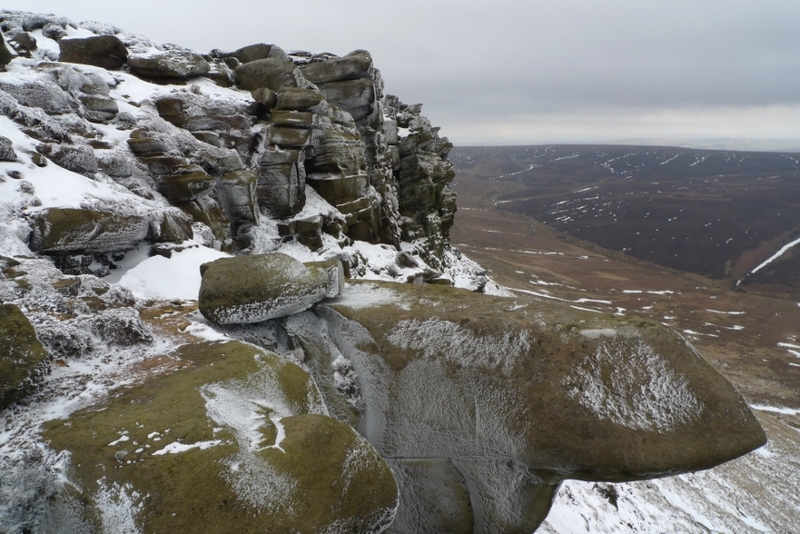 Kinder was the first ‘real’ hill that I ever climbed and was one that I returned to time and time again, probably due to the fact that I did not drive and there is a train station in Edale. I probably got over familiar and my love affair with its sticky black peat diminished. Time to get back and see what the attraction was in the first place. 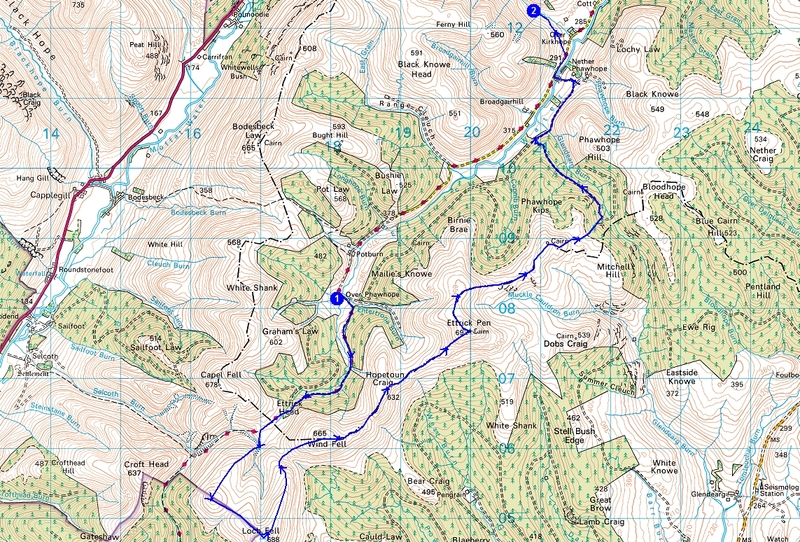 I noticed that there is a car park marked on the map just past Barber Booth at the western end of the Edale valley. I arrived at about 10.30am and just managed to squeeze into the last spot, you may have to get here really early to secure a spot on a nice warm summers weekend. I have to admit that I started the day without much of a plan, I just wanted to get high. A nice muddy high that leaves you slightly out of breath and with a good view. Crowden brook was always my favourite Kinder Clough and gives a good bit of scrambling in its higher reaches, so I started there. Almost immediately you leave the green of the valley behind and enter a moorland world. I noticed that the highest part of the valley looked pretty snowy and icy so changed my plan (its easy to change your plan if you have no plan). 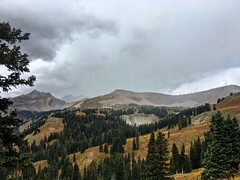 I turned right and ascended the steep hillside next to an unamed tributary valley, the views soon opened up. Higher up I was met by one very large snow drift that may well be around for some time yet. Now without crampons and an ice axe this was a rather difficult obstacle (ok I could have walked round it). The downside of lightweight footwear is that you cannot kick steps into rock hard old snow. I went for the momentum approach and ran up hoping that gravity would be fooled, something not to be done if failing means sliding more than a few feet. 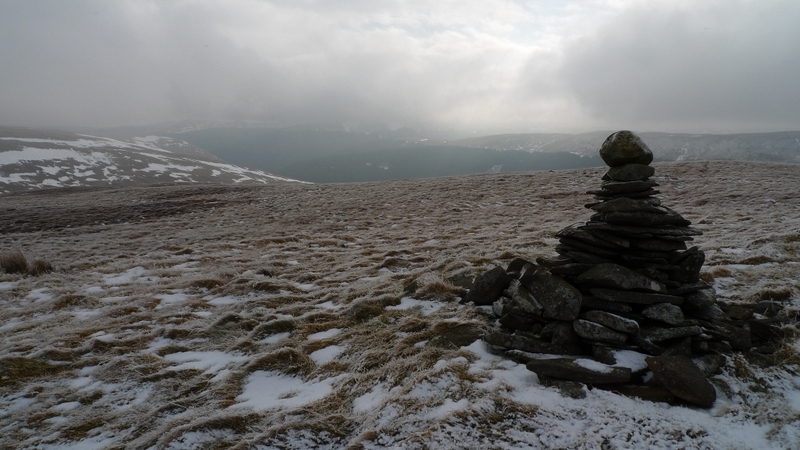 I was soon at the cairn of Grindslow Knoll which I had timed to avoid a very large group. It was proper bitter up there, a real bone biting wind and not a hint of brightness to give any illusion of warmth. My buff got its first ever use as a balaclava. To avoid getting tangled in more large groups I kept off of the main path which meant that I found a convenient boulder to pose on. I probably looked silly running about with a tripod but that is what happens when you are billy no mates on a Saturday afternoon. I was soon at the head of Crowden Brook and it looked like I made the right decision by not scrambling up, the stream was frozen with just a small trickle of water. 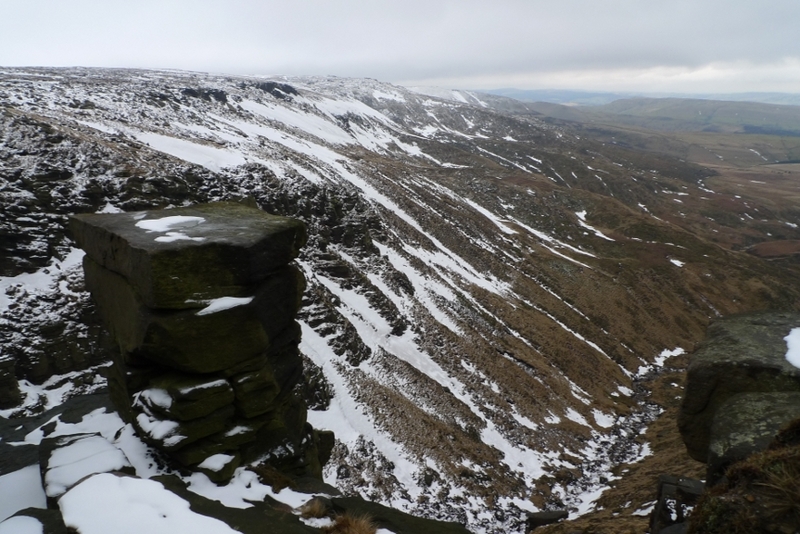 I decided to head across the plateau to Kinder downfall, a good test of navigation skills. Well it has to be said that I failed immediately. Thinking I knew the way I headed off without getting the compass out, well it felt right. When I did get out the compass I found out that I was heading in completely the wrong direction, Kinder does that to you. 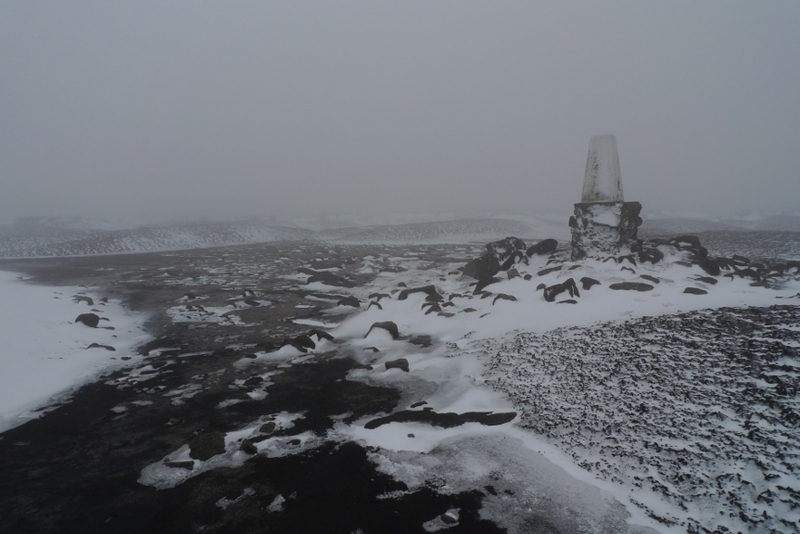 Always use a compass on Kinder if crossing the plateau and trust it. That soggy peaty mess just drains away any sense of direction! It has to be said that it was one of the easiest crossings that I have done. 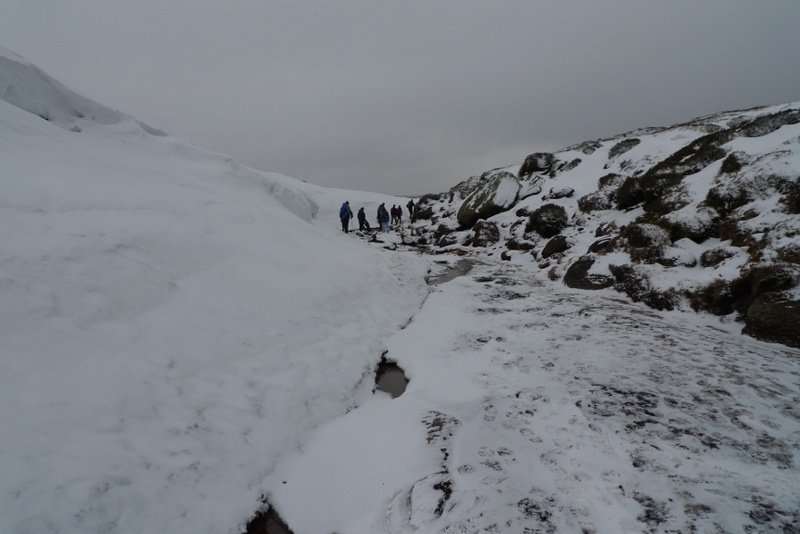 The black peat was as hard as iron and the deep gullies that consume unwary ramblers were full of snow. 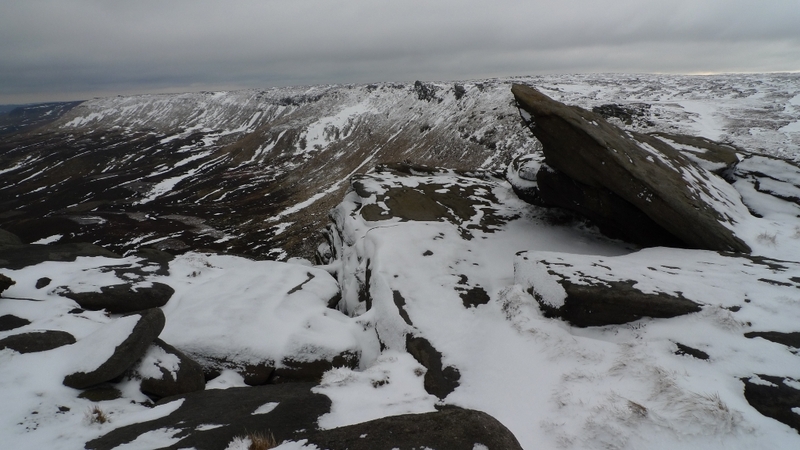 I was soon at Kinder Gates, a spot that for some reason really appeals to me. 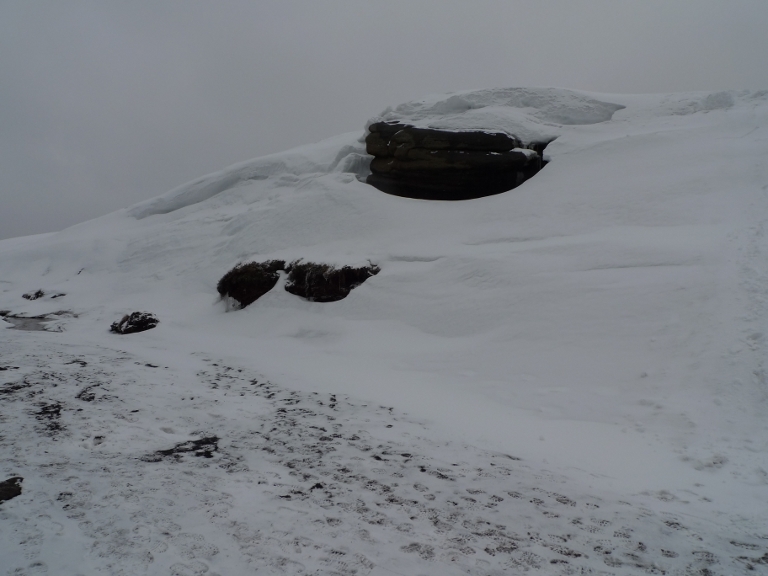 Here the snow drifts were of epic proportions, dwarfing one of the rocks and even with a small cornice at the top. A good 15 to 20 feet high, the weather that created it must have been pretty impressive. Passing another huge group at Kinder Gates I revised my plan and set the compass to the head of Fair Brook and the northern edge. 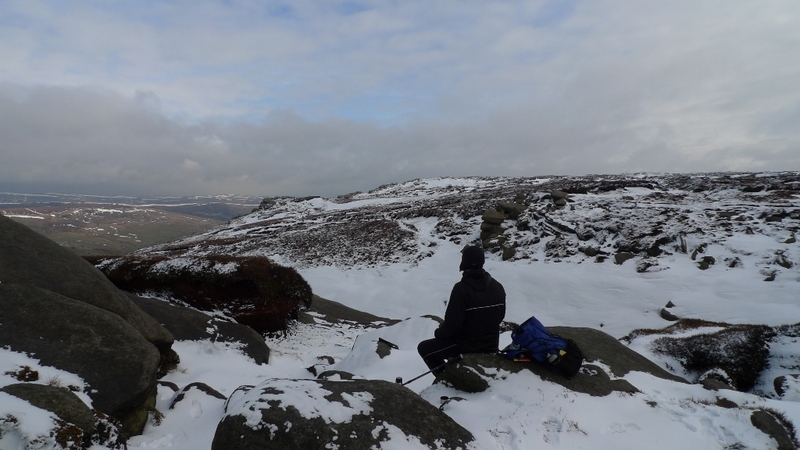 Here at last I found a landscape empty of people so sat and had lunch looking across the desolate moors of Bleaklow. The well trampled paths of the southern edges was replaced by just a narrow line of footsteps through the snow. 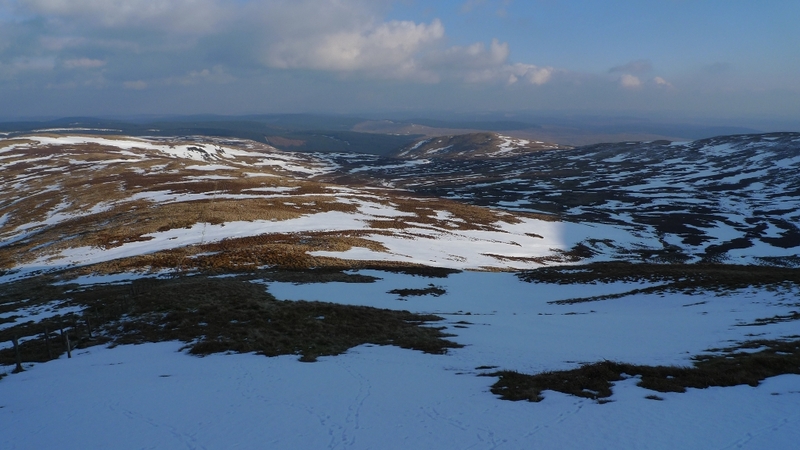 The airy perch of Fairbrook Naze is a great viewpoint with the snow clad higher slopes contrasting with the dark moorland lower down. The unhindered northerly wind along the edge froze my face into a grimace and there was a lot more fresh snow underfoot. All the rocks here were covered in a thin layer of hoar-frost. It was not a place to hang around and as I looked across to Bleaklow I could see lowering clouds heading my way. At Upper Red Brook I left the security of the edge and headed across country again towards the trig point at the exact moment the mist came down. The compass came out immediately this time and I was relieved to see the white trig on its rocky plinth loom out of the mist. 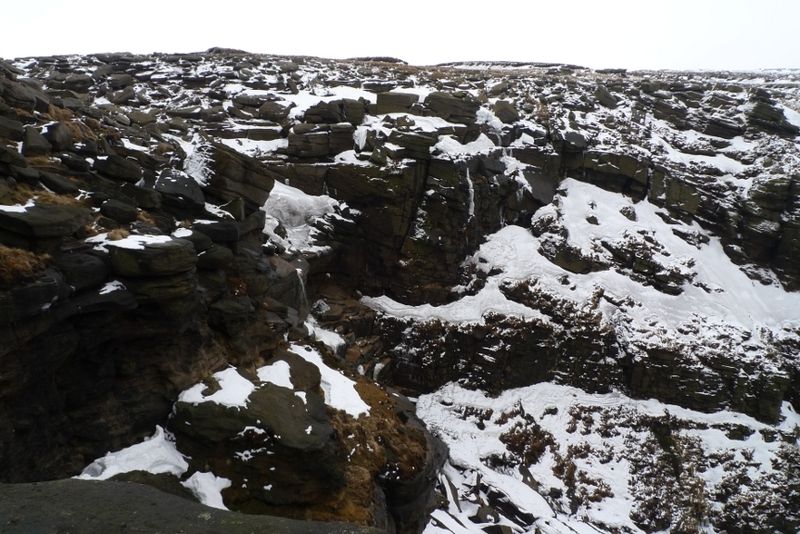 A short distance due south and I was back on a well trodden path to one of the wonders of the Peaks, Kinder Downfall. Unfortunately it is difficult to get a good view of the falls from above but the area never fails to impress. Alas my camera battery ran out in mid shoot and could not be coaxed back to life. I left and promptly got tangled up in another large group of people. 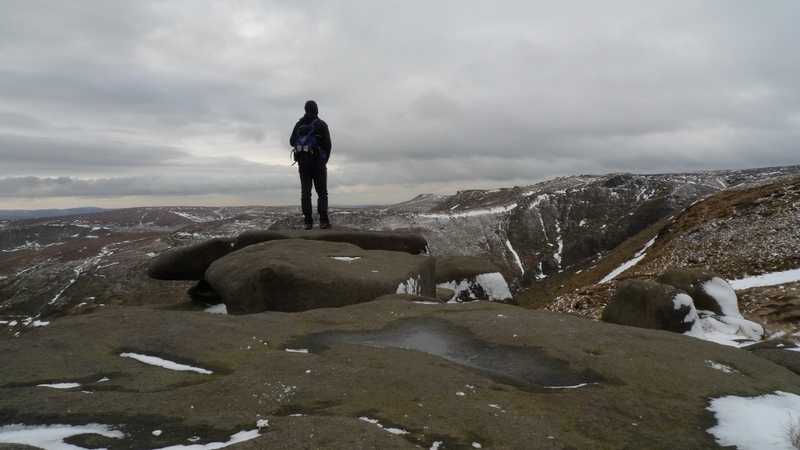 I really cannot work out what it is with the Peak District and people who insist on walking with 15 to 30 others. Maybe I am just an unsociable, miserable sod but I found myself getting annoyed listening to inane conversations about mobile phone tariffs whilst trying to pass them one at a time. Near Edale cross I decided against Jacobs ladder and thought I would treat my tired legs to Brown Knoll as my boots were not yet muddy. Alas the morass was frozen here too so I crossed this sticky peaty morass with ease. Torch reluctantly came out, a party was in full swing at Dalehead farm and the Bongo was the last vehicle in the car park. Now lets return to the other type of backpacking. There has been a fair old gap since the last one of these, the first two in the series can be found on the ‘Trips abroad’ tab above. Well the last week or so has been pretty hectic – have actually done lots of travelling and sightseeing (for us!). We left Dehli for the lovely? 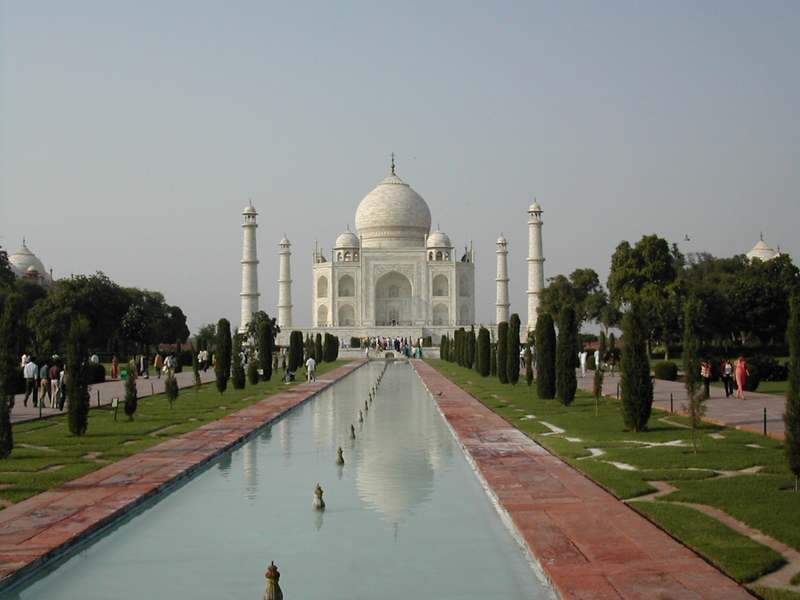 city of Agra to have a gander at the Taj Mahal. It was really rather nice! Just as you would imagine it to look like. But the cost of entry was a bit steep at 750 Rupees, Indians pay 20 Rupees. Not fair we think. We managed to have a scary day by cycle rickshaw along a busy main road – not recommended. We then went to Gwalior further south to see the fort on the hill. This must be the hottest place in India, felt like a hammer hitting us on the head. Sweaty pants. We had the hottest hotel room in India there too and shared our beds with bed bugs which are not the best guests! We hurried out in the morning and retreated to a posh air con place (all of 550 rupees). The fort was nice. 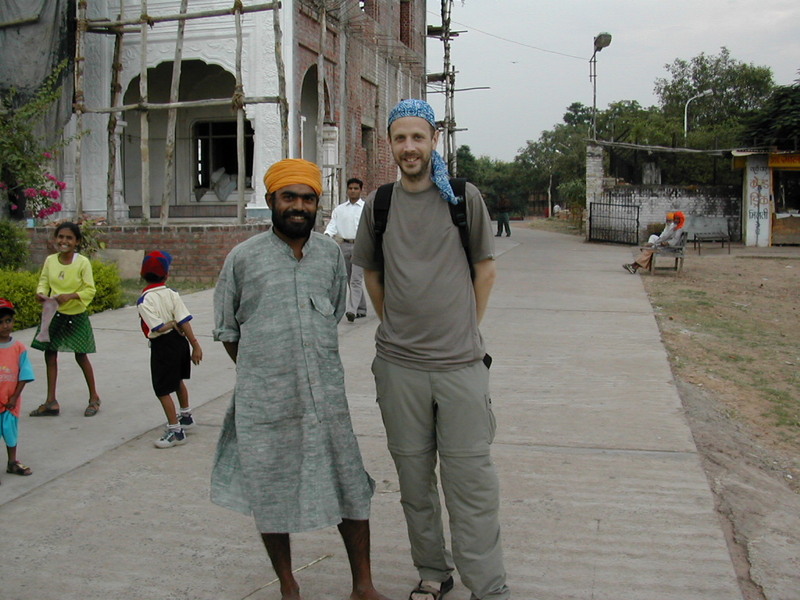 Then south again to Jhansi to spend a couple of nights in Orcha. Now this is a special place. Tiny village surrounded by Thai style temples and palaces (and only 30 rupees to get in!). Very very peaceful. We were the only tourists in some of the temples. Lots of mozzies so we have now embarked on 8 months of malaria medication. We were having a Thali in a street side restaurant the first night we took the tablets, the owner asked if the food was ok. We said yes, five seconds later Corrina was vomiting in the gutter. The Policeman had to move his chair quickly! Then south again! We hit Bhopal and had a quick look at the impressive mosque (one of the biggest in Asia). Then north? 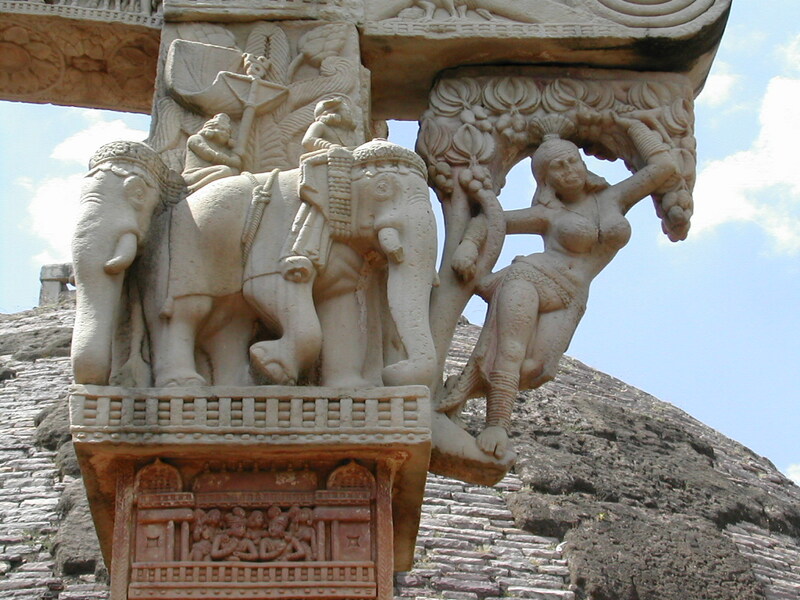 to the rather lovely Sanchi. 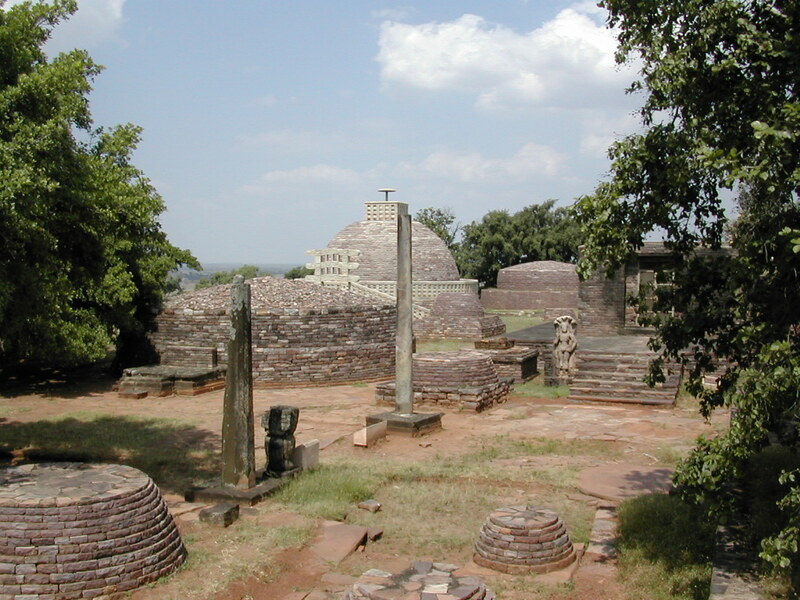 On top of a hill (the best things are always on top of a bloody hill in hot places) are the oldest Buddhist monuments in India. 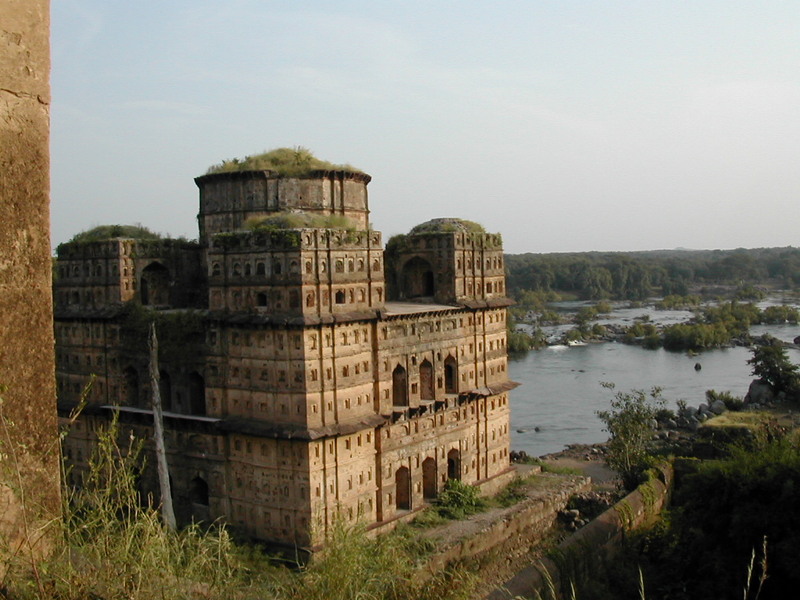 Huge stupas and ruined temples. The oldest Buddhist art dating back to 3rd century BC. But no hanging around for the super duo who headed back to Bhopal this morning. Now, purchasing rail tickets in India. So far easy up until today. We tried to get some from Jalgaon to mumbai for Monday. No such luck, all trains full. So we are on the waiting list – we will find out if successful when we reach Jalgaon which itself is 8 hours away by train tomorrow. 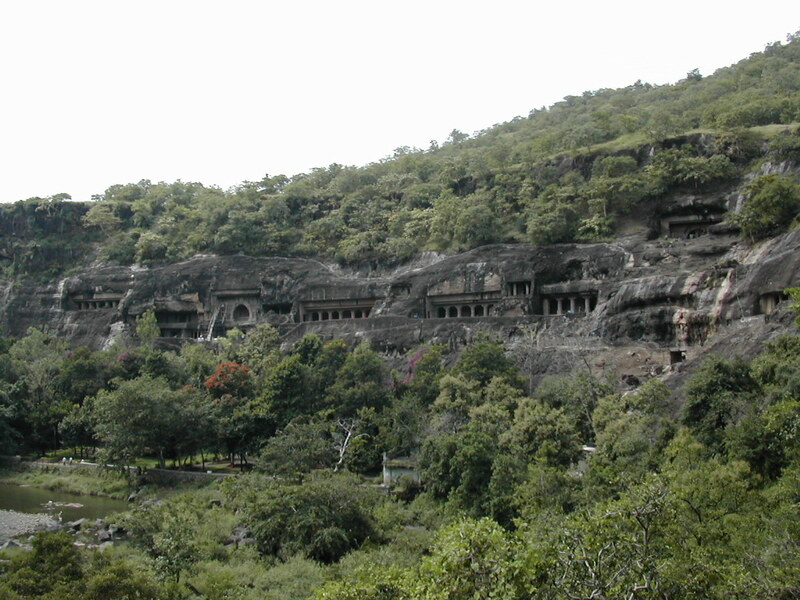 When we reach Jalgaon we will pop to see the Ajanta caves. We may be in Mumbai (Bombay) hopefully Monday night – keep your fingers crossed for us! Will check email there and hopefully put an end to this current curry run. We need food that is not curry! Just how can you refuse such an offer. The balloon was very very impressive! As we write we are going a bit nutty in Mumbai. Our journey down to Jalgaon was actually very pleasant for an 8 hour train journey, but we do travel 2 tier air con. The poshest on most trains, our 8 hour 450km journey cost all of 10 pounds each. A lot of money in India but cheap as chips compared to home. 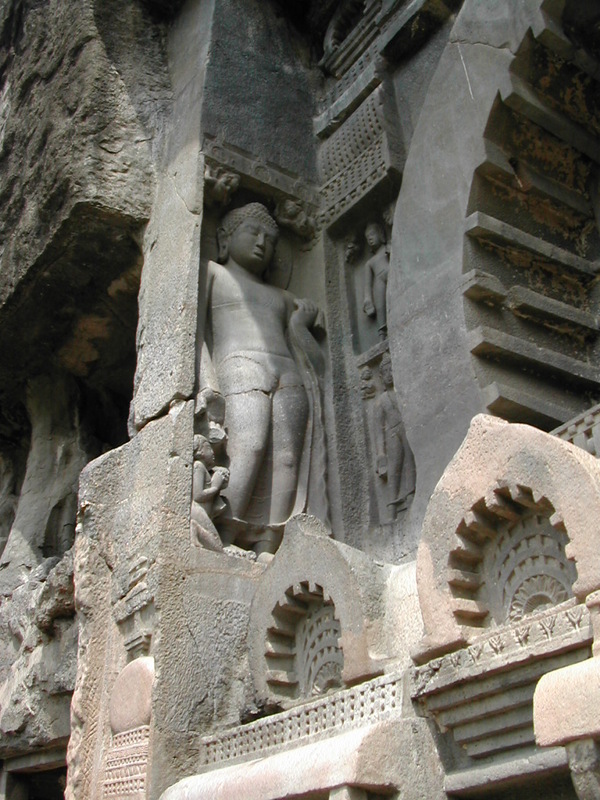 From Jalgaon we did a day trip to the Ajanta caves. A trip in a ‘local’ bus to get there. The word ‘local’ bus strikes fear into our hearts. It usually means ‘rusted deathtrap’ in Hindi. The drivers are fearless nutters and they cram the passengers on like sardines. Did you know that 78% of rural Indian households do not have toilets? This was shown rather explicitly as we left the city in the early morning. Lovely views of bums and garbage. Some things in India dont change. Ajanta when we arrived was lovely. 30 Buddhist caves in a horse shoe gorge. Some very impressive rock carvings and cave paintings. Plus a huge Buddha in every cave. It was also Sunday so the place was full of day tripping Indians all in their Sunday best. We were minor celebs for the day and featured in many family and school photos. Our ticket to Mumbai turned out to be ok as the carriage was completely empty! So much for being waitlisted! However, the Dadar express did not go to Dadar station but another Mumbai station much further from the centre. It was like buying a ticket to London only to find the train only goes as far as Luton! At least we had the company of the mad conductor for the journey who tried and failed to get us food and plied us with Betel nut and chewing tobacco (kids dont do it, nasty nasty). We turned down the offer of whisky! The train was also only two hours late. We ended up in LTT station 20km from our hotel, at night. Let us be prey to taxi touts! Our guard will never be down again. They seemed nice, offered to use the meter (very rare) and then tried to charge us 600 rupees for the trip when we arrived. 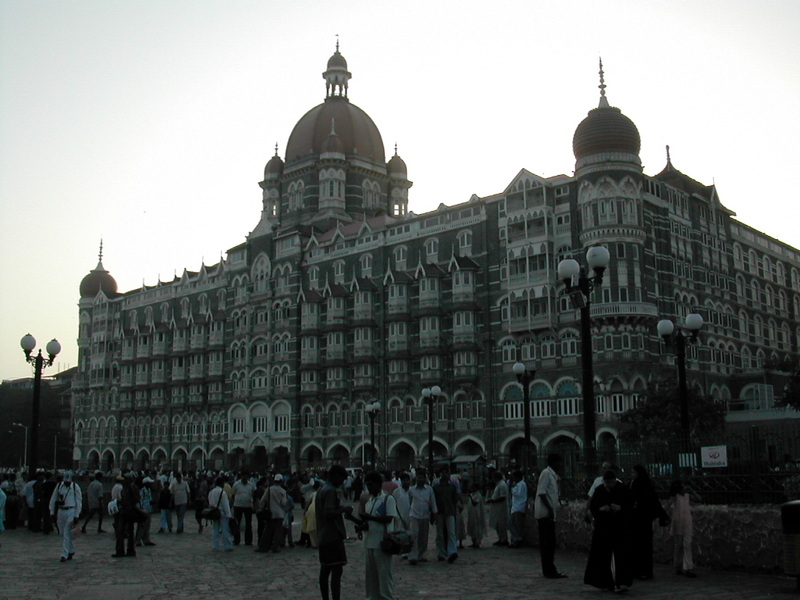 We threatened to call the police and got back up from our hotel staff and would only give them 300 rupees. Welcome to Mumbai! At least Mumbai is cooler than the north. We must be acclimatising when we think that 31 C is cool! A much cleaner place than smelly Dehli and lots of things to see and do. But very very expensive, we are paying over 10 pounds for our room, so budget will be dented for the next few days. Booked ticket for Goa for next Monday – waitlisted number 15. So fingers crossed we can leave for the seaside. Hopefully off to Matheran the day after tomorrow (confused because we wanted ticket to Neral Junction but given one to a place 30km further on). So a trudge back to station tomorrow to complain and winge and stuff. Impressive Raj building but absolute chaos inside.